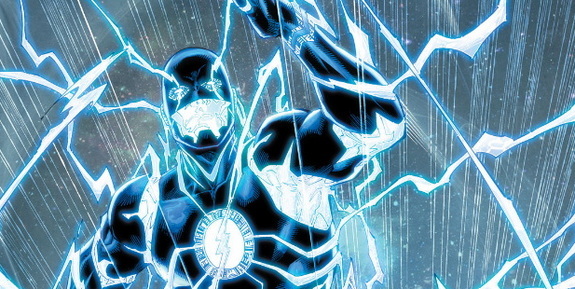 Venditti: That’s had a very personal effect on Wally, in the sense that his mother had gone missing during Forever Evil, and then he’s part of this enormous police backlog, where the force is trying to get itself up and running again after this as well. You can imagine the number of open cases there’d be. And they’re still coming in. They don’t even know what they all are yet. Then on top of that, Wally coming from a background where he’s somewhat estranged from his father, which is in keeping with original Wally continuity — you know, he really looked up to his Uncle Daniel, who the Flash ended up putting in prison. So in some ways, Wally’s the 12-year-old kid who’s had a bit of a rough go, and he’s trying to cope with it as best as he can, and he’s sort of lashing out in this way, almost like a form of protest against the Flash. Jensen: One of the things that’s really neat about the relationship with Wally is that — and this is true of a lot of characters — that Barry has different relationships with the same character based on whether he’s in costume or he’s out of costume, and that’s something we’re going to explore a lot, especially with him and Wally. But in terms of the kind of character that he’s going to become, I think that’s a large part of what we’re trying to do. We are showing you these Future Flash sequences where you see, obviously, Wally ended up having a very, very close relationship with Flash again, which is something that I think fans are accustomed to, but it’s a matter of how he got there…How that relationship goes and how we come from this place now, where Wally isn’t exactly happy with Flash, to growing into somebody to whom Barry will end up becoming very close, is what we’ll explore, as Van was saying earlier. Jensen: Much of it looks like this straight road from Barry and Wally meeting and being at odds, to eventually them having a strong relationship — but there are a lot of wrinkles along the way that are going to come up. Venditti: You’ll definitely find out what exactly is going on with the Speed Force, and why Barry is having problems losing time. That’s a central mystery of the whole first arc that we’re going to be doing. So those answers are going to be hinted at more and more each issue, and the resolution of all that, we’ll see very soon. Venditti: [Laughs.] That was my line. It’s taken on a bit of a life of its own, which is completely unintentional. I have two kids, so yeah, I wrote that line. Nrama: So wait, you said unintentional? I mean, Barry is the reason, because of Flashpoint. Was that in your mind when you wrote that? Venditti: Not even in the slightest. It was more of that sort of, just … average home life, U.S. Census Bureau data, you know? Married family, two kids, white picket fence, dog — that sort of stereotypical description. Jensen: Yeah, I can never overstate how little Rob knows about past continuity, at some point. For much more, including the personality and motivation of Future Flash and the West family dynamic, check out the full interview at Newsarama! Anyone else think it’s hilarious that one of the guys bringing Wally back doesn’t know anything about him? I call bs on the ‘two children’ line because the publications of these comics don’t end with whoever puts what in any of these speech bubbles. I wish DC wouldn’t would stop acting like none of us KNOW THAT. Yeah that SO does not give me hope for ANY of this working out. It sounds like one is familiar and one isnt. That was either a lie or not very smart of Venditti to say he did that on accident. Cant why you would llie, so yeah not too happy having someone who doesnt know much about the flash writing em (dude pick up a few comics for god sakes). But still hope…thats comment about 32 with two kids was an accident…really? I mean…if we’re giving Wally a pass on his delinquency because he’s having a rough time, why not Jason Todd? The kid was an orphan living in the streets. I would say both characters had hard lives, but theft, assault, and property damage are still on the extreme side of the “brattiness” scale. Far, far beyond things like talking back to adults and throwing tantrums in a supermarket. Wow. I sent a post twice and neither showed. The Not!Wally kid is a brat. His background does not excuse bad behavior as he looks to be old enough to tell what’s wrong and what’s right. (He did hide that malicious smirk from Iris.) I don’t care what this kid’s name is, I don’t like him. I didn’t like NuBart and I don’t like this lame publicity-gimmick drowned Wally. The thing I’m most upset about? The hair. What the heck did they do to “Wally’s” head? Not only is he not a red head as he should be, but he looks nothing like the adorable Wally I remember. This makes me a bit sad. So far this looks like one of those times when they came up with a completely different character and decided to put a beloved character’s name on it in order to try and sell him to us. I’ll watch this develop, but I don’t have the energy to be angry anymore, just disappointed.